As we walked through St Leonard’s we found a little gem of history. It is tucked away in a corner and easy to miss; so easy to miss, in fact, that we missed it. We had to turn around and come back. You would have thought that a table that is almost a thousand years old would be displayed with a bit more prominence, especially since William the Conqueror used it for his dinner; this is a very important table. If William hadn’t marched off to Hastings on a full stomach who knows what might have happened? I say that William ate from this table, but to be fair the plaque displaying this information contains a caveat: “Tradition says” that William used the table. I’m prepared to go with this and accept it as fact. It is a pretty good looking table. It looks like a steak. If I had just landed and was about to conqueror Britain I think I’d choose this table for my dinner too. 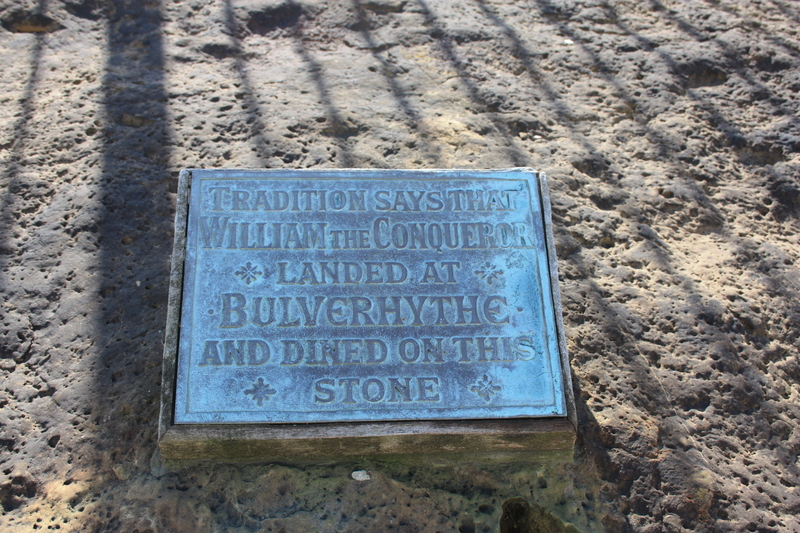 William, as the plaque says, landed at Bulverhythe. Bulverhythe is situated a mile and a half or so to the west of St Leonard’s, equidistant between St Leonard’s and Bexhill. The beach there is a rather quiet place, probably due in no small part to the fact that the town it belongs to is separated from it by a railway line which runs parallel to the coast. 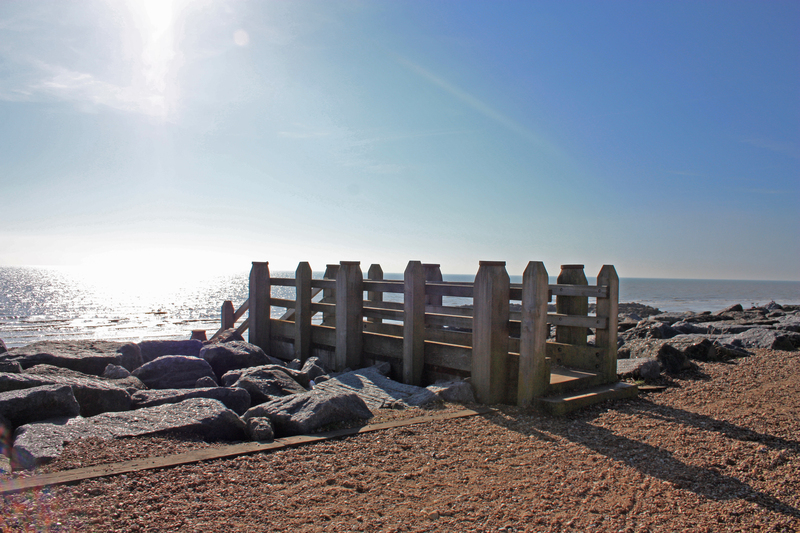 Although it seems rather quiet and subdued when compared to the towns to either side of it, Bulverhythe Beach in fact has quite a lot to offer, even though you can’t see a lot of it much of the time. Bulverhythe was not always a beach. Approximately 140 million years ago it was a subtropical flood plain and a home to dinosaurs. Fossils, including bones and footprints, have been found here. More recently, about 4,000 years ago, Bulverhythe was a forest. Now submerged, at low tide well preserved branches are exposed on the foreshore. 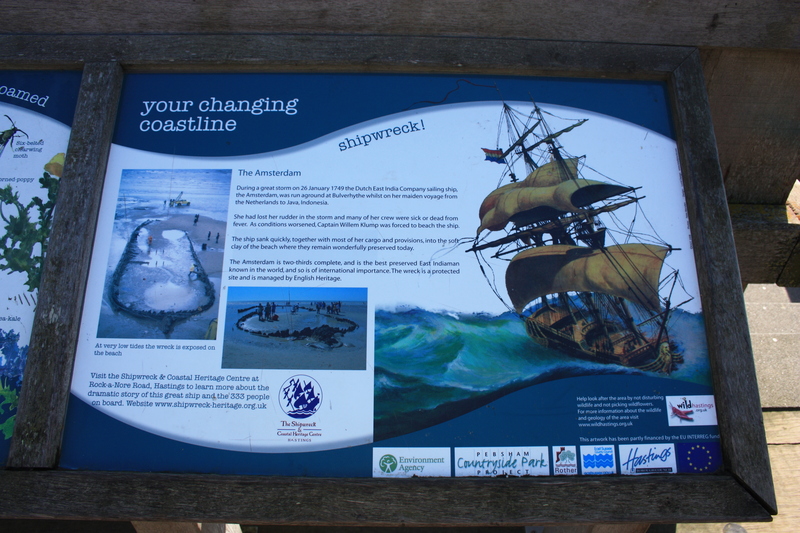 Bulverhythe is also the resting place of the Amsterdam, a Dutch East India Company sailing ship. 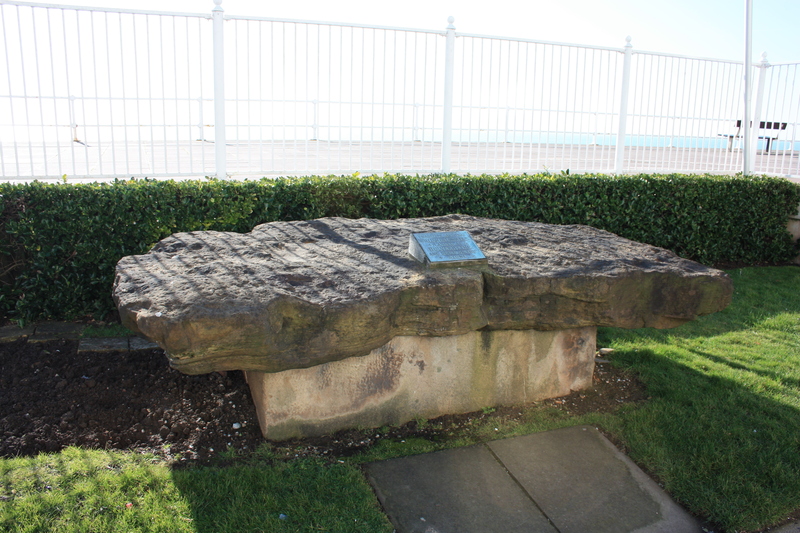 It ran aground here during a storm in January 1749, sinking into the clay, where it too has been preserved. Two thirds of it lie under the sand, the top of which peeks up at low tide. It is considered the best preserved East Indiaman in the world. The tide was in for us today, and we would have had to wait several hours for it to recede. As it was, we had to make do with a notice board which had picture of the site when exposed at low tide. This entry was posted in East Sussex and tagged amsterdam, bulverhythe, coast, East Sussex, table, travel, walking, william the conqueror. Bookmark the permalink. What an interesting stretch of coastline! Yes – it was a pity we didn’t get to see the Amsterdam but tide and time wait for no man!